- Main event: Impact Old School. Starts at 17'00h. - Trials Impact Returns Legacy and side events: from 16'30h. - Main event: Impact Returns Legacy. Starts at 10'00h. - Trials Impact Returns Modern and side events: from 16'30h. - Main event: Impact Returns Modern. Starts at 10'00h. - Side events: from 16'30h. Preregistering yourself will save you money and will assure your spot on the tournament/s (and provide hotel room and/or food if you want). You can pre-register yourself HERE. - From 16'30 to 17'00h: Old School. ​- From 16'30: Impact Returns Legacy, trial or side event. - From 09'00 to 09'50h: Impact Returns Legacy. - From 16'30: Impact Returns Modern, trial or side events. - From 09'00 to 09'50h: Impact Returns Modern. - From 16'30: side events. Trials: same format as the tournament they feed. 8-man, single elimination, REL: regular. Side events: legacy, modern, standard or pauper. 8-man, single elimination, REL: regular. ​Impact Old School: Swiss + TOP4 or 8. REL: competitive, more info HERE. Impact Old School: unlimited proxies. 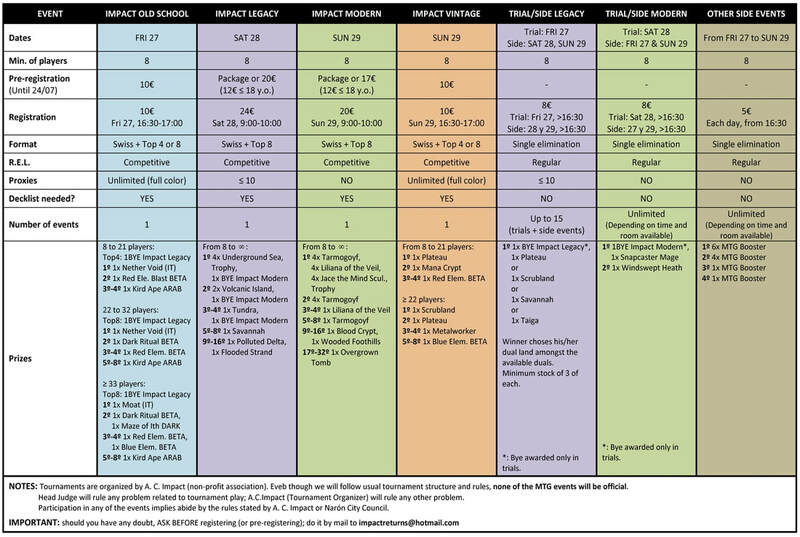 Impact Returns Legacy and its trials: up to 10 proxies. Impact Returns Modern and its trials: no proxies allowed. - In color; use regular paper over a basic land sleeved like the rest of the deck (if double sleeves are used, double sleeve the proxies too). Make sure they fit perfectly inside the sleeve. - Easy to spot unsleeved, easy to see the difference from an original card. - Once sleeved and face down, they can't be distinguished amongst other real cards from the deck. - Easy to relate to the original card. - They must also follow any other rule used for alterations. - Fake cards won't be accepted, no matter their quality. - Players are encouraged to check their proxies with the Torunament Organizer BEFORE THE EVENT, to see if they are allowed or not. Tournament Organizer's decision can't be appealed, so make sure you have substitutes for your proxy cards just in case they are rejected. Competitive events require decklist. You can download, fill and print THIS pdf. Proxies MUST be identified in the decklist; failure to do so will result in a "Decklist problem - Game Loss". Players are allowed to play any number of trials, but they only can earn a maximum of 2 byes for each event. We expect to hold other events during the weekend, like role-playing games, Warhammer 40.000, videogames, etc. like we did last years, but this info probably won't be available until late June. - Will raffle 1x Flooded Strand y 1x Polluted Delta (Onslaught) each one. - Every pre-registered* player up to the moment will be eligible. - 2x M25 Booster each round, among players in the main event (Legacy). - 1x M25 Booster each round, among players in the main event (Modern). *: payment must have been received and confirmation mail from Impact sent. In order to collect their prize, the awarded player must collect it him/herself during the Weekend. Not doing so will cause loss of right to the prize.